Reserve your spot on the Norwegian Encore today! Scheduled to debut in 2019, the Norwegian Encore will be the fourth and final Breakaway-class vessel in the Norwegian Cruise Line fleet. She'll truly redefine what it means to do "freestyle cruising" with new restaurants, more activities, and more accommodation options than ever before. Able to carry nearly 4,000 passengers, she'll be Norwegian's largest ship in addition to its newest. With perks such as anytime dining, highly-customizable shore excursions, and more single staterooms and family suites than ever before, Norwegian Encore will bring a whole new level of personalization to your cruise experience. One of the world's leading cruise lines, Norwegian Cruise Line is known for its exciting, resort-like ships which sail to popular destinations around the world. With world-class entertainment, a huge array of bars and restaurants, and onboard activities for passengers of every age, there's never a dull moment on a Norwegian cruise. Take advantage of early-bird rates and secure your spot on the Norwegian Encore today! 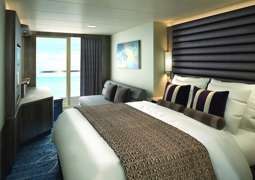 Norwegian Encore offer several classes of elegantly-appointed staterooms to best suit your needs. Whether you're a solo traveler looking for the most affordable option, a large group or family wanting to stay together, or a couple looking to celebrate a special occasion in the utmost luxury and style, Norwegian Encore has something for you. 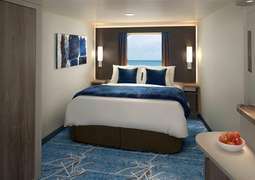 Studio staterooms allow single cruisers to travel without paying the dreaded single supplement, and a wide range of connecting and family staterooms are perfect for groups. 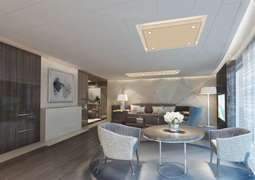 Back by popular demand are the exclusive Haven Suites at the top of the ship, where you can retreat to your own personal paradise and enjoy top luxuries such as a private balcony, a personal butler, and a whirlpool tub with jets. 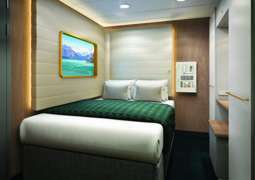 All staterooms are designed with understated elegance and outfitted in calming white, navy blue, or gray. Though the exact dining options on the Norwegian Encore have yet to be announced, passengers can count on some Norwegian signatures to be there: Steak and seafood, Italian and French, guests' favorite cuisine is sure to be represented onboard. Rumor has it that Texas barbecue joint "Q," first introduced on the Norwegian Bliss, will make an appearance, serving its signature hickory-smoked ribs and barbecue brisket. Country music lovers will delight as the venue transforms into a honky tonk at night, with live country music, dancing, and more. Those looking for a more refined experience will find all they desire at French restaurant Le Bistro, where tuxedo-clad servers offer up the finest vintages to go with the classic French dishes on the menu. Don't miss out on Norwegian Cruise Line's world-class entertainment. From Broadway-style shows to live music and dancing, there's something for everyone on the Norwegian Encore. Kids and grown-ups alike will delight in the catchy cabarets and full-scale musicals in the ship's theater, and late-night comedy caters to a more adult audience. Regularly-held theme parties spice up the night, and live music and dancing takes place in most of the bars and lounges after dark. Norwegian Encore has no dress code, and resort casual is the predominant style onboard. No flip-flops are allowed in the dining areas, and swimwear is only allowed at the pool.